I love living in Utah but the climate here is really dry so whenever fall and winter roll around my skin gets super dry and sometimes itchy! 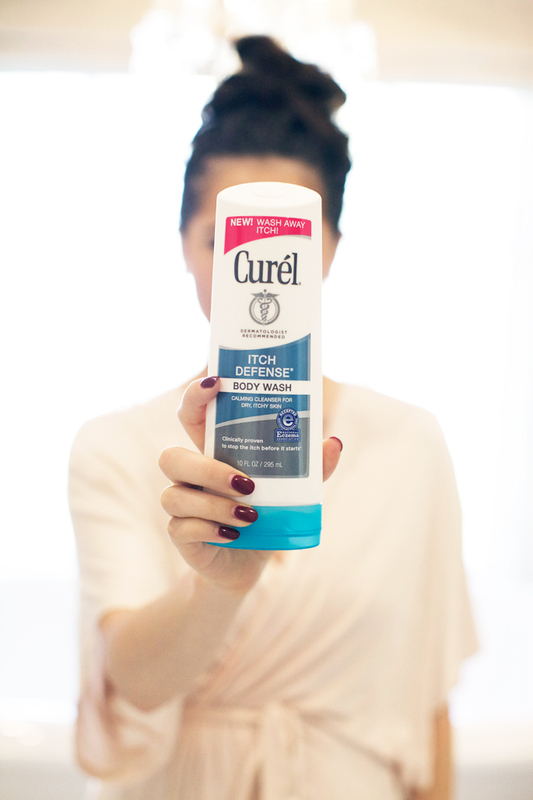 I just started using this Curél Itch Defense Body Wash and I love how it soothes and hydrates my skin. The formula is a blend of gentle cleaners and conditioners -including hydrating jojoba and olive oils- so it doesn’t irritate my skin, it relieves it. I’ll definitely be using it all season long! What are some of your tips for keeping your skin hydrated during fall and winter? Brought to you by Curél. ohhh such a nice post. I like to have my skin hydrated, it is essential. Isla is just too cute! My skin gets super itchy when the cold months hit–it’s started already! I have been able to get by though with lotion in the morning and right before I go to bed. Love your pretty bathrobe and the body wash sounds like a perfect product for moisturizing the skin! Your baby is so adorable too! Oo yes! My skin gets so dry and itchy during the winter and I am always looking for anything to make it better! Baby Isla is so precious. Moisturizing my skin is so essential! Lovely photos! You’re such a natural beauty! I was actually just thinking that I needed to find a better moisturizer for the fall/winter! This sounds perfect, thanks for sharing! Love your nail color! Perfect for fall! This body wash seems ideal for moisturizing our skin in the coming colder months! 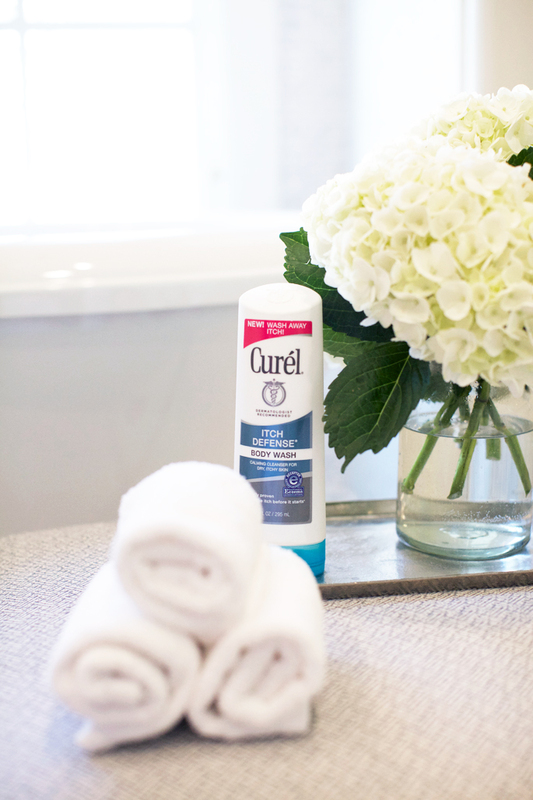 I’ve never tried Curel, but I’m a big fan of anything I can pick up at Target! Cold weather is so great, but the dry skin, not so much. Love your robe, so pretty! Such an adorable photo! Have you ever heard of Beautycounter? I am a loyal customer because they do not use any harmful ingredrients; Curel has two kinds of parabens in the ingredient list. The Beautycounter products are safe for you and they have products for your sweet little Isla Rose, too. Beautiful pics! This body wash sounds like a must for the cold East Coast weather that will be arriving in a few months. we don’t have that brand in Italy. I use Aveeno body moisturizer every day after the shower, it’s great! Nice pics and great bathroom btw! That body wash sounds amazing – – I get such dry skin, I will definitely be trying that out! The best homemade jam recipe is up on the blog today! I get the same way this time of year in NY. Have you ever used bath melts from LUSH? Omg they are amazing (if you are a bath person like me you would enjoy these!) They make your skin so soft and hydrated, you should try them! The last pic is too adorable! I always find myself my hydrating my skin and face more thoroughly during the colder/drier months. Oh thats great! Ill have to try it out! This is great!! I have dry skin naturally so this time of year it gets really bad. Thanks for sharing! So adorable! What is the color of your polish and what brand please. Ooooohh! Sounds amazing. I will be picking this up this season. My skin tends to get dry and itchy in the winter. I hope you have an amazing day, beauty! Little miss Isla is getting so big and is looking more and more beautiful every day, like her momma! ooo nice I have to try that! It gets so dry in Utah too! Glad you found something that works for you. I struggle with the same thing. My skin also gets dry in the fall and winter. I am definitely going to try this body wash. I definitely need to try this! My skin always feels somewhat dry and itchy around this time! I was just saying how itchy I have been and it’s only fall. I will give this a try! Super cute pic also. We’ll definitely have to try that body wash soon! I need to try this body wash! I use Cetaphil cream it’s serious skin care. It comes in a 16 oz jar for $12, and it’s worth every penny. It’s not greasy. I love that you do these posts on the different beauty products you use! I am always searching for new things. Thanks for sharing! Aww, what a sweet picture! I always apply almond oil or grape seed oil kt my skin before putting on the lotion and it helps the lotion soak in and locks in the moisture! I’m currently in love with Dove or Nivea body wash, Bath& Body works Eucalyptus stress relief body scrub that is so relaxing, following body moisturizer by Soap & Glory.